But tonight I took just one child with me to the grocery store to "get supplies" for our very small New Year's Eve party tomorrow night. And I found clarity. I couldn't find the napkins...but the joy I have in raising these little beings came rushing back like it had been holding it's breathe. And when I got home, my rustling of grocery bags somehow woke up my 4 year old daughter. (She has candy wrapper rustling radar. There may or may not have been candy. Don't tell my vegetables.) And with her bleary eyes, she came wandering down the hall and without a word, she kissed me and went back to bed. And so at the end of this long and wonderful year, I am extremely grateful for my little family that we have moved across the world and back. And I am also grateful beyond words for my much larger family -- YOU -- that has come with me on all my adventures...and encouraged and loved me. Thank you all! 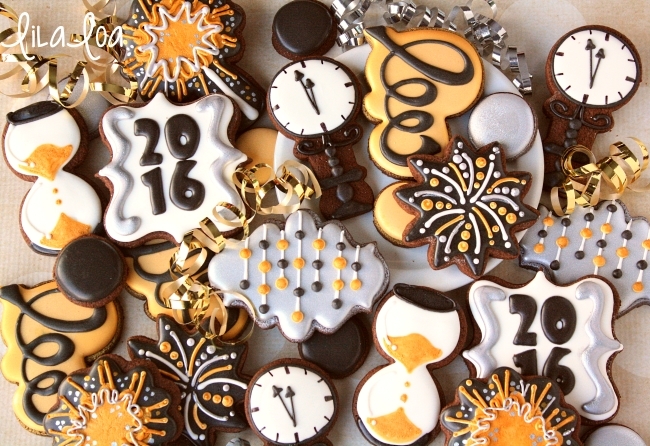 And I hope you have only the most wonderful and happiest of a New Year!!! 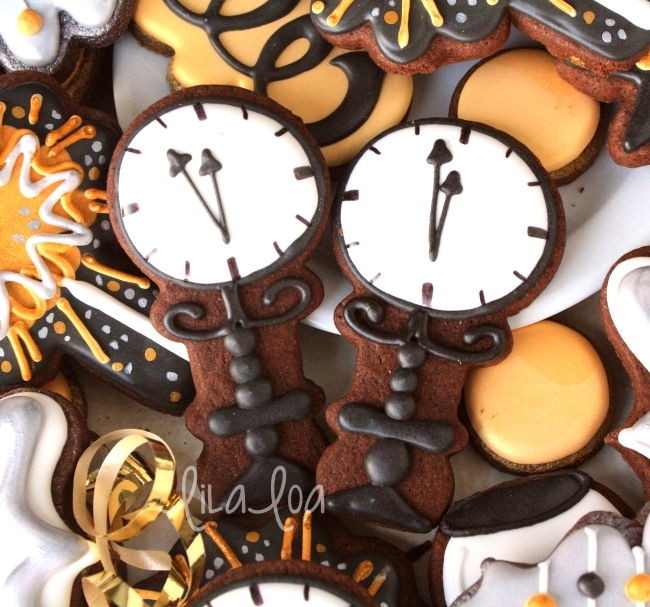 Want to make some clock cookies? They are super easy! 1. Cut off the very bottom of the rattle cookie before baking. Using a medium consistency black icing and a #3 tip, pipe a small triangle on the bottom of the cookie, add a horizontal line across the first jutty-outy-part and then a dot above that. Outline the face of the clock and let everything dry for a couple of hours so you won't get color bleed on the next step. 2. Fill in the clock face with white icing. Use the same black icing as before to add more dots in the empty spaces. Let it dry for another couple of hours. 3. Add two small loops under the clock face and then switch to a #1.5 tip and add some hands. 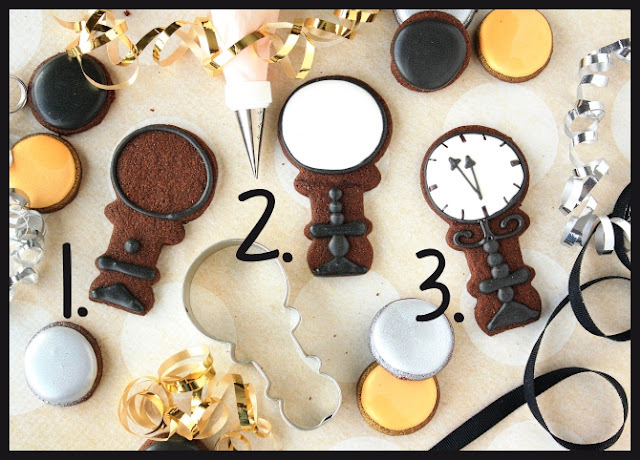 Use the same icing to add the notches around the clock or go lazy and use a black food color marker like me. Your choice. Grab the rattle cutter HERE or HERE. The confetti cutter is from Semi Sweet. (It's actually an ampersand cutter.) The sparkler cutter is Arty McGoo's flower pot cutter. Learn how Sweet Sugarbelle makes her confetti cookies HERE. Get the lowdown on how to make the SPARKLER cookies or the CONFETTI STRING cookies.